It's the original Whistler Mountain Bike Park zone with all 5 difficulty levels including the infamous A-Line, and all 5 skill centres. The Fitz Zone features a trail to suit every rider whether it's your first time or looking to take things to the next the level. Situated on the lower slope from Whistler village up to the Olympic station at 1000m (3,300ft), here is the core energy of Whistler, spreading out from the central trails around the lifts, deep into the forests on either side as far as Crank it Up and Golden Triangle. Review: All kinds of awesome! But everyone knows that. Review: So many trails, with variety of skill levels. Loving Crank It Up and B Line. 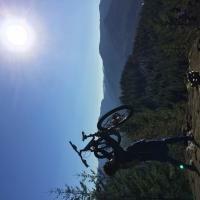 Whistler Bike Park Fitzsimmons Zone MTB Trail 5.00 out of 5 based on 3 ratings. 3 user reviews.